Justin Mollenard is a sailor and arms smuggler who does not support the hypocrisy of society. He has a wife in Dunkirk who reproaches him the fact of having neglected the family for many years. 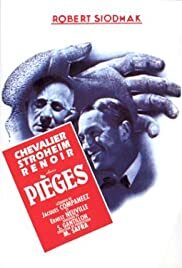 "Pièges" was Siodmak's last French movie (unless we count his failed remake of FEyder's "le grand jeu").And it was the great thriller he had threatened to make during all the thirties.Both "tumultes" and his curious "Mister Flow" were interesting but they were absolutely dwarfed by "Pièges". "Pièges" is not perfect though: There's a certain vagueness in the middle of the film,when the heroine (Marie Déa) becomes a servant in a rich house .Déa plays an amateur undercover policewoman cause one of her friends was a victim of a maniac who stalks his preys through small ads . On the other hand ,the choice of Maurice Chevalier was not a good one.Who can believe he's a serial killer?This singer (who sings two ditties:"mon amour " and "Il Pleurait Comme une Madeleine" (=he was crying his eyes out)is in a thriller like a bull in a china shop. Pierre Renoir's performance is brilliant.Like Hitchcock,Siodmak did not like the whodunit that much and he knows we cannot suspect Chevalier.So his study of Renoir's character is absorbing,recalling sometimes Lorre's performance in Lang's "M" ,which the expressionist lighting effects reinforce:the scene when Marie Déa is asleep in a room where only the ticking of a clock is heard is first-class film noir stuff. People who are familiar with Siodmak's American career should have a look at "Pièges" .It contains their seeds.